A box set of the first three prehistoric animated children's adventures. In 'The Land Before Time', young dinosaur Littlefoot is orphaned and so he sets off with a gang of fellow baby dinosaurs in search of a legendary green valley that offers safety from the plague that is sweeping the world. In 'The Land Before Time 2 - The Great Valley to Heaven', the young dinosaurs are coaxed into the forbidden 'Mysterious Beyond' by the mischievou..
Second collection of animated films from the prehistoric 'Land Before Time' series. In 'The Land Before Time V - The Mysterious Island' (1997) Littlefoot (voice of Brandon La Croix), Cera (Anndi McAfee), Spike (Rob Paulsen), Ducky (Aria Curzon) and Petrie (Jeff Bennett) ignore the advice of their elders and set off in search of food. Instead they discover an island of great beauty and mystery that lies beyond the Great Valley. In 'The L..
Third collection of animated films from the prehistoric 'Land Before Time' series. In 'The Land Before Time IX - Journey to the Big Water' (2002) a storm floods the Great Valley so Littlefoot (voice of Thomas Dekker) sets off to explore. He meets a new friend called Mo (Rob Paulsen), a prank-playing dolphin-like creature who can't find his way back to the Big Water. 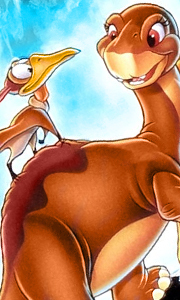 Littlefoot and his pals come to the rescue, evade a scary sharptooth an.. The Land Before Time: Setting out to find the lush feeding grounds of the legendary Great Valley, a young Brachiosaurus named Littlefoot meets four other dinosaurs who join his quest. On their daring trek the brave little band encounters daunting challenges. The Land Before Time: The Great Valley Adventure: The enchanting tale continues in the beautiful, peaceful Great Valley where Littlefoot and his plant-eating friends live and play .. The musical dinosaurs from the Great Valley are back for another song-filled adventure. Littlefoot (voice of Alec Medlock) dreams that he has found a land filled with brontosauruses like him. When he tells his grandparents (Kenneth Mars and Miriam Flynn) about the dream, they take it as a sign that they should set out and look for the land Littlefoot is describing. After many days of travelling, they are thrilled to discover a new world..
Littlefoot and his grandparents share an unusual ‘sleep story’ that leads them on a fantastic journey! The always curious Cera, Spike, Ducky and Petrie quickly follow behind. Throughout this enchanting adventure, they discover many new creatures, wonders of nature, dangers and delights! They eventually meet up with the largest gathering of dinosaurs ever, including one very special Longneck that Littlefoot thought he would never see! Fe..
Everybody's favourite prehistoric pals are back! Join Littlefoot, Cera, Spike, Ducky and Petri in this delightful, all-new, feature-length movie. The enchanting tale continues in the beautiful, peaceful Great Valley where Littlefoot and his plant-eating friends live and play under the watchful eyes of their parents. But when mischievous Cera coaxes the group into the forbidden "Mysterious Beyond", they soon find themselves in big troubl..
Own The Land Before Time 5 - The Mysterious Island DVD from Deff, DVD, Blu-Ray & 4K Video Specialists - Free UK Delivery..
Littlefoot, Cera, Spike, Ducky and Petrie are back in an enchanting new, feature-length adventure from the beloved The Land Before Time series! Littlefoot has witnessed an amazing sight: a "stone of cold fire" that fell through the night sky and landed somewhere in the Smoking Mountains. But Littlefoot is the only one in the Great Valley who saw the stone and he can’t find anyone who believes him! With beautiful animation, delightful so..
Littlefoot, Cera, Spike, Petrie and Ducky resurface in an enchanting all-new musical story about the wonders of discovery. When heavy rain creates a mysterious "new water", Littlefoot sets off to explore the Great Valley. He quickly becomes friends with Mo, a prank-playing dolphin-like creature who can't find his way back to the Big Water. Littlefoot and his prehistoric pals come to the rescue, evade a scary sharptooth and prove the val.. The jolly dinosaurs from the Great Valley return for another song-filled adventure. When heavy rain creates a mysterious 'new water', Littlefoot (Thomas Dekker) sets off to explore the Great Valley. He quickly becomes friends with Mo (Rob Paulsen), a prank-playing dolphin-like creature who can't find his way back to the Big Water. Littlefoot and his prehistoric pals come to the rescue, evade a scary sharptooth - and prove the value of c..
Embark on a journey into an enchanting prehistoric adventure with dinosaur pals Littlefoot, Cera, Spike, Ducky and Petrie in his acclaimed classic for the entire family. In a long-ago age of rumbling volcanoes and perilous earthquakes, a young bracheosaurus named Littlefoot suddenly finds himself on his own. Setting to find the lush feeding grounds of the legendary Great Valley, he meets up with four other young dinosaurs who agree to j..
Own The Land Before Time - Amazing Adventures DVD from Deff, DVD, Blu-Ray & 4K Video Specialists - Free UK Delivery.. The first four animated films from the prehistoric 'Land Before Time' series. In 'The Land Before Time' (1988) young, orphan brontosaurus Littlefoot (voice of Gabriel Damon) sets off with a gang of fellow baby dinosaurs in search of a legendary green valley that offers safety from the plague that is sweeping the world. In 'The Land Before Time II - The Great Valley Adventure' (1994) the young dinosaurs are coaxed into the forbidden 'Mys.. Your favourite prehistoric pals are back in an all-new adventure filled with fun and laughter! This time around, the Tinysauruses invade the Great Valley to teach Littlefoot a big lesson about a little lie. Meet their new tiny friends and sing along to brand new songs. The Invasion of the Tinysauruses shows that heroes, friends and families come in all shapes and sizes! Special Features How Do I Find Things?, Sing-ALong-Songs: You Are ..
Own The Land Before Time - Day Of The Flyers DVD from Deff, DVD, Blu-Ray & 4K Video Specialists - Free UK Delivery..
Fun takes flight with your favourite prehistoric pals Littlefoot, Cera, Petrie, Spike and Ducky in this all-new, soaring adventure! "The Day of the Flyers," an important event for all of the flyers in the Great Valley, is rapidly approaching, and independent, free-style Petrie is having trouble flying in a group formation with is siblings. His friends try to help him, but a "fuzzy" newcomer named Guido gives the most helpful advice - th..
Own The Land Before Time - Wisdom Of Friends DVD from Deff, DVD, Blu-Ray & 4K Video Specialists - Free UK Delivery..
Get ready for lots of laughs with your favourite prehistoric pals and their new friends in the funniest journey ever! Featuring memorable new songs and the hilarious voice talents of Academy Award winner Cuba Gooding Jr. and Golden Globe winner Sandra Oh (Greys Anatomy), it's an adventure filled with dino-riffic fun and heartwarming friendship! Littlefoot, Cera, Spike, Petrie and Ducky are excited to meet two goofy and lovable yellow-be..
Own The Land Before Time 2 - The Great Valley Adventure / Land Before Time 5 - The Mysterious Island DVD from Deff, DVD, Blu-Ray & 4K Video Specialists - Free UK Delivery..
Own The Land Before Time - The Time Of Great Giving DVD from Deff, DVD, Blu-Ray & 4K Video Specialists - Free UK Delivery..
Own The Land Before Time - The Sercet Of Saurus Rock DVD from Deff, DVD, Blu-Ray & 4K Video Specialists - Free UK Delivery..
Own The Land Before Time - The Stone Of Cold Fire DVD from Deff, DVD, Blu-Ray & 4K Video Specialists - Free UK Delivery..
Own The Land Before Time - The Big Freeze + Christmas Decoration DVD from Deff, DVD, Blu-Ray & 4K Video Specialists - Free UK Delivery..
Own The Land Before Time - Journey To Big Water DVD from Deff, DVD, Blu-Ray & 4K Video Specialists - Free UK Delivery..